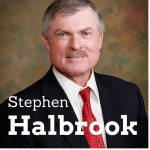 Stephen Halbrook is both a lawyer and a writer and has written several books on the subject of the second amendment. He speaks to Jason today about his more recent book – Gun Control in the Third Reich, which is about Nazi Germany disarming the Jewish people. Stephen also talks to Jason about gun control in both American and Europe and shares his thoughts and expertise on the subject. 3:30 – Stephen couldn’t find anything in English about the disarming of people in Nazi Germany, which is why he decided to write the book Gun Control in the Third Reich. 6:30 – Hitler’s right hand man said that there would be a 20 year sentence to the concentration camp to any Jew who owned any kind of weapon. 11:00 – In 1938, the Jews of Germany were ordered to turn in their guns. The Nazi’s disarmed everyone that they didn’t trust. 16:30 – Jason says that all over the US you see police forces with tanks and high-end weapons. What are they preparing for? 19:10 – Stephen says that many Americans are gun owners and it would be very hard to outlaw that. 20:40 – What can people do to protect their gun freedom? Stephen says understand your rights. 25:40 – There’s a lot of diversity in American and where various religious groups stand on gun control. Gun Control in the Third Reich by Stephen Halbrook. Welcome to the Holistic Survival show, this is your host Jason Hartman where we talk about protecting people, places, and profits you care about in these uncertain times. We have a great interview for you today and we will be back with that in less than 60 seconds on the Holistic Survival show. By the way, be sure to visit our website at HolisticSurvival.com. You can subscribe to our blog, which is totally free, has loads of great information and there’s just a lot of good content for you on the site, so make sure you take advantage of that at HolisticSurvival.com. We’ll be right back. It’s my pleasure to welcome Stephen Halbrook to the show. He is a research fellow at the Independent Institute and author of Gun Control in the Third Reich: Disarming the Jews and “Enemies of the State”. Stephen, welcome, how are you? I’m good, Jason. Thank you for having me on your show. Well, the pleasure is all mine and give our listeners a sense of geography, tell us where you’re located. Okay and are you an attorney? Fantastic. So, tell us how you came to write the book and and let’s dive into your thoughts on the subject. Well, the book Gun Control in the Third Reich had its inception really decades ago. This is an aspect of Nazi history that’s never been documented. It’s been talked about a lot, either the Nazi did or did not disarm political enemies. What rolled the gun control and play in the rise of the Third Reich when Hitler came to power in 1933 and I found there was just nothing on the subject on anybody, secondary sources, historians just don’t cover that. There’s thousands of books on the origin, development, and what not on the Nazi dictatorship, but the way that the disarming of the selected population took place was never documented by any historian. So, it was my aim to collect material on that. There was nothing in English that I could find and there was nothing even in Germany secondary sources to speak of, so what I did was to visit archives in Germany and then I actually obtained the services of an expert archivist in Germany who knows all the archives and knows the subject very well. The Third Reich subject that is, not the disarming issue. For several years we collected documented and I’ve got file cabinets full of the subject, they’re in Germany, they originate from the 20s and 30s basically and the result is the book. Fantastic. So, you know, there is somewhat, well, semi-famous quote that floats around in pro-gun circles, pro-second amendment circles of which I am in those circle and it is a quote attributed to Hitler saying something along the line, I believe that was the Night of Broken Glass, as it is referred to. Supposedly he said something along the line of, “This day will go down in history as the day we made our streets safer.” Etc, etc. What he was really doing was preparing for massive obsession and evil. Do you know about that quote? Are you aware of that? Yeah, I’ve seen that on the internet and I think that it’s an invented internet quote. I’ve never seen any documented for it and it never appeared in any of the sources that I found. The case is a lot stronger than that in terms of what happened. I mean, the story starts in the Wiemar Republic in the 20s. There was a lot of political violence that the commies and that the Nazi were fighting each other in the streets trying to seize power and things like that. So, they passed gun licensing and gun reregistration. They warmed that the records should not fall into the hands of radical elements and low and beyond 1933 radical elements took power in Germany and that would be Hitler and the Nazi party and they immediately used those records to find out who among their political enemies had guns and cancel their gun permits and that would be social democrats and various conservative parties. I mean, all of these parties were later abolished in 1933. National socialism became one party in the state. So, it’s very clear how the policies were used to disarm political enemies and in 1933 at the time of the Night of Broken Glass, once again, Jewish gun owners were identified of such and disarmed before the violence started against them, weeks before, and, of course, Kristallnacht, the Night of Broken Glass took place and the Jews were disarmed. The head of the SS hanger, Hitler’s right hand man decreed there would be a 20 year sentence in the concentration camp for any Jew who had any kind of weapon. This is the reality. So, I don’t know why people make up stuff on the internet the way they do, but the case is much stronger than that single quote. I mean, that single quote though certainly sound like something Hitler would have said or believe, I’ll tell you that, but the case is even stronger. It’s interesting that quote is, you know, evidence enough whether, you know..
Yeah, the quote depicts his thoughts, certainly, that’s true, but it’s not quite accurate, but it was his intent to disarm his political enemies, to incarcerate many of them, to eradicate them even, and that was the policy and that part is well documented, that’s recognized, but what’s not documented before this book is where did it start? It started with some bad laws in the Wiemar Republic that were made use of by the Nazi dictatorship. What else was in Hitler’s grand plan here to, you know, to disarm people? I mean, it just seems so obvious. I can’t believe people don’t learn from history. It is really, really mind boggling. Just look at what happened a couple of years ago in Iran when Iranian forces were shooting into crowds of unarmed people and, of course, Twitter fortunately got a lot of this news out. That was a huge benefit. Not that it changed the outcome at all, because, you know, Obama didn’t do anything certainly, but if the Iranian people had guns that country would be free and probably unoppressed by now, wouldn’t it? This something in any oppressive society is always the case that political elites disarm people they don’t trust and James Madison talked about that in the Federalist Papers, he said, “In Europe they’re afraid to trust people with arms, even though they have huge monarchies with huge armies. Here in American, we do trust people with arms.” That was the whole basis of having the second amendment, but it’s just by definition that an authoritarian regime is going to disarm the population or at least those that it distrusts. It will arm those that it trusts all the while keeping heavy regulation and restriction over them to make sure they stay in line. I mean, Hitler dictatorship armed a lot of people and the armed forces didn’t they didn’t take their guns at home though. In Switzerland they have a militia army where that’s even the case today, but it was never the case that the Germany people were trusted with arms even at the end of the regime when they had so-called people’s army. The old men and the boys, they didn’t have any guns at home either, they were armed on the spot and told to go commit suicide fighting the Russians. Yeah, it’s incredible. So, could have anything been done back then to change the outcome? I mean, what do the Jews thing? Did they sort of went along with it? They thought that, you know, where there any sort of second amendment type thoughts going through the population at that time? First of all, turn the clock back to the Wiemar Republic, they had the same gun debates, gun control debates as you hear today. Proponents of restrictions, wanted to monopolized the means of balance in the hands of police and military, law abiding people opposed that, persons who were gun owners, sportsman owners, things like that, and they lost the debate. There was never a constitutional tradition like the second amendment in Germany. So, when the Nazi came to power, people didn’t really think they were going to last very long, because none of the coalition government said it had existed up to that time lasted very long, but they had tremendous staying power because they immediately smashed their enemies and disarmed them. You can go down the list of license holders and found, oh, this person is a social democrat, we’re going to cancel his gun license. I’ve got documented of that in the book. Gradually as the power increases in every aspect of life they had what they’d called forcing into line, every aspect of society, and that would mean sports organizations, labor unions, religions, brain washed the young people, get them into Hitler youth and all that so that you had a population that was counted into obedience. I mean, you still have a lot of descent into that. It’s not like they were matching in the same direction. You know, the propaganda films show all that cheering people, but life wasn’t like that in reality. Could it have made it a different if people were armed more or had the…Germany recognize the right to bare arms before all of this happened, maybe so, the Nazi certainly thought so because they took great pains to disarm people any kind of person who they didn’t trust. When it came in 1938, the Jews of Germany were ordered to turn in their guns and it was known who had them because of the registration records and there were some who didn’t comply and they were rounded up. I mean, they were taken in by the Gestapo, even those who turned in their guns were interrogated by the Gestapo. So, would it have made it a difference? No body knows what would have happened, but I can tell you a lot of people sure wished they had a chance to defense themselves. Certainly would have made differences in individual cases and would there ever be an armed partisan movement, no body knows. Yeah, well, it certainly would have saved some lives. I don’t think any body can argue that. There would have been a few resistors that would have been saved. You know, as the SS was rounding people up and committing their evil. So, where does it stand in Germany? Is all of Europe kind of anti-gun? It kind of amazes me they’ve got the history right there, it’s relatively recent. It seems like that place would have the strongest gun freedom laws. The strongest second amendment type of mentality would be in Europe. Right, and here’s the irony of this. In 2013, January the 1st. Germany proudly announced that it had complete computerized, centralized records on all legal gun owners that was in 2013, the 70th, if I’m doing my math right, anniversary of the Third Reich coming into power in 1933. They didn’t learn any lesson whatever. Of course, these are just the legal gun owners. What good does that information do other than if the regime wants to confiscate those guns? I mean, the illegal people, criminals, they didn’t register any guns and this is the requirement of the European union so all the other European union countries are falling into line. So, no, the lessons were not learned. Wow, it’s amazing those lessons were not learned. So, where do we stand now, in your opinion, in the United States and other countries around the world? Well, just in terms of European content, for example, there’s a lot of support of the right and keep bare arms. I would say Switzerland and Finland are the two foremost countries in that regard. They have very high rates of gun owners, a long tradition of gun ownership, but there’s significant aspect German and French society, for example, where gun owning is a long tradition. There’s a number of hunters there, target shooters, and there’s people who realize with all these registrations and restrictions that guns can be confiscated. I mean, Spain is another country like that. In the United States we have mixed results. We have probably, oh, I don’t know, maybe 8, that have repressive gun laws. They have certain kinds of registration. They ban guns that they don’t like. They pejoratively call them assault weapons. We’re talking about New York, Connecticut, California, New Jersey, a few states like that, but that’s not the case in most states. I would say 42 states are relatively free in terms of gun ownership here in the US. The second amendment is finally recognized by the supreme court as of 2008 in a very comprehensive opinion. It was a slim margin. It was 5 to 4. Is that the Washington DC case? Yeah, the DC handgun ban. The DC versus Heller. Right. That was refreshing though. I’m glad they recognized that even in DC that DC was being unconstitutional. Right and 2 years later Chicago their gun ban was thrown out in the McDonald case, which held that the second amendment applies to the states, not just the federal government. That was a big victory, but again it was 5 to 4, so it’s a slim margin in the supreme court. There is support for restrictive measures in the congress, but they don’t have the support of any majority and the selection year. I mean, the democrats are running from the issue. They don’t wanna have anything to do with that issue, most of them. It’s not a popular idea in congress right now. It’s just amazing. I mean, you know, when you look around the US, we see these police forces all over the country with military equipment. I mean, tanks, you know, grenade launchers, it’s..I mean, what the heck are they preparing for? It’s crazy. Well, we have a militarization of law enforcement in this country, but it’s fueled in part by forfeiture law. They are able to seize assets of people who can’t challenging or will not challenge it because they might not win. It’s expensive to litigate cases like that, but what do they use the money for? I’m sure some of it goes to good purpose, but a lot of it goes to buying these kinds of equipment. Military surplus equipment for example. You end up having police offices looking like they’re no different than the soldiers fighting in Afghanistan and things like that. We have an unfortunate rise in SWAT type tactics used to arrest people for just fairly innocuous crimes like gambling or things like that. It’s a growing trend and I think there’s more recognition for this kind of problem today, because it’s an unfortunate incidents and publicity of about forfeiture law. I mean, it’s really something. It seems like even if like the US population keeps their guns even has more guns than they have now and by the way I love that quote from years ago about the Japanese, I guess it’s emperor, I think it was Hirohito that said, you know, someone asked, “Are you going to invade America?” And he basically responded with, “Are you kidding? There’s a gun behind every plate of grass in America.” *Laughter*. Well, there’s actually a gun in about half the household and that’s a pretty good record and that’s a dissuasive factor in dissuading repressive government. I mean, we have, despite all the problems, we have jury box, the valent box, and the cartridge box. Even though government forces are very, very powerful, the populated by our friends and neighbors. Soldiers and police offices, many of them are gun owners of the constitution and the bill of rights and so, it’ll be very difficult I think to go the ultimate route like you do see in other countries where you have a take over of government and a total destruction of a constitution by military and police forces. The thing is though, even with all of that, with the policed departments becoming so militarized, a bunch of handguns won’t stand a chance against the kind of equipment the police are using nowadays. I mean, they’re basically the military. It’s not like they used to be where it could be somewhat of a playing field with local government and police forces if they ever did incredibly oppressive and if the population ever had to defend itself against the government. Well, hypothetically though, I mean, okay, so they have M4s and M16s that are full-auto, but full-auto is not accurate. I mean, American citizens have semi-auto rifles and they’re very accurate. You gotta be..if you wanna hit a target you gotta be a fool to put it on full-auto, so there’s a lot of advantages to ordinary guns that civilians have in the country very wildly. Interesting. So, what would you say are some action steps people can take in the US, for sure, but any other advice around the world too in order to keep or promote more gun freedom or just to maintain what they have? Well, I think the founders of our country had it right. They basically intended that we would know our rights and be ready to protect them. That’s a very general statement to make, but knowing your rights means you can read what the bill of rights states and Americas have always understood the second amendment exactly what it said, but it went through a long phrase where courts were saying, “Oh, it doesn’t mean that at all. It doesn’t protect the right of the people to do anything, it’s the power of the state to maintain militias.” Well, the population saw right through that and I think you do have a pendulum where people vote different ways, but I think it sometimes comes down to it where they finally see the light. At any rate, the first step is understanding that you have certain rights, having those rights recognized and following up by any means to enforce those rights and that has to do with exercise your right to speak and assemble the press and the jury system. I mean, these are all ways that we have and ultimately we have the second amendment right. Most definitely. How about around the world? Well, it’s the same story everywhere, isn’t it? I mean, you’ve got a lot of repressive dictatorships worldwide, particularly in the third world countries. Europe is more relatively free, but you have more restrictions and they issue becomes do they repeat the mistake of the past or do they learn from them? I mean, there’s so much going on internationally that it’s difficult to bring it in within one formula, but I mean, not knowing the Ukraine, just a year ago, I posted an article in the second amendment in the Ukrainian law review and there’s a lot of interest there and Russian itself for gun ownership by law abiding people. So, I mean, there’s a two sided story and there’s not one side that prevails. Yeah, it definitely is. Stephen, give out your website and tell people where they can find out more. StephenHalbrook.com and you can get my book on Gun Control in the Third Reich just by Goggling the book name and putting my name in there. You can get it from Amazon or virtually any where that’s the nice thing about getting books today. There’s so easy to get, you never have to leave your home. If you look at my website you’ll see other information on books I’ve published on the second amendment and otherwise. You know, last question for you, I remember years ago reading Dennis Prager’s book and Dennis is a great author and radio talk show host in Las Angeles market and in his book, Think A Second Time, he talked about Judaism tends to be liberal and liberals don’t like guns and it’s kind of ironic to me. It just doesn’t make sense, you know, it’s a non-sequitur. You’d think that a population that has been so oppressed throughout history would be the first to be all for the second amendment. You know? Your book certainly addresses this with what happened in Germany under Hitler, do you have any thoughts about that or reason why that is so or maybe you disagree, I kind of doubt you do, but..
First of all, I kind of just want to debunk the myth. The Germany Jews, they were very assimilated in the Germany society. They were patriotic, many of them had served in the great war honorably, they were a number of offices and they were gun owners. As my book documents, there’s no data on that of course, there’s no data on any type of group that how much they had guns of that time. We only speculate even today in terms of the United States, but they were much part of Germany society. They hunted, they owned guns for various purpose, and they were widely disarmed because the authorities knew they had these guns. They were registered. If you look at Israeli society, you’ll see a society where there’s very significant training of all sectors of the population, men and women, in use of firearms. There are different kinds of regulations in terms of private keeping of arms, but you’ll see guns galore throughout that society and they use them to protect themselves, protect schools from terrorist attacks. Oh, in Israel, for sure, but I’m talking about in the US. You know, it’s like you got the Hollywood crowd, they anti-gun crowd, and every time there’s a shooting, they’re all crying how they need more gun control, yet the movies they publish are full of gun violence. In fact, some of them even give the perpetrators of these heinous acts the ideas for their crimes. Yeah, in any community, of course. ..There is significant support in gun ownership. Thank you, Jason. Thank you very much and take care.